Medium hairstyles with bangs are very popular because of their versatility and low maintenance. Find great medium hairstyles with bangs to get you inspired for your next new hairstyle. When it comes to hairstyles everything is permitted as long as it offers only advantages to the hairstyle and the person wearing the hairstyle. 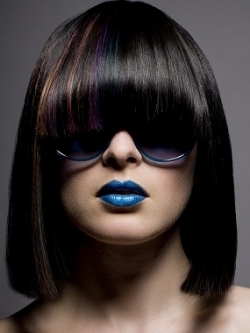 Bangs hairstyles are great hairstyles which have become very popular due to the changes they bring. Bangs are known for totally transforming the look of a hairstyle without changing the length or the overall cut of the hair. These particular qualities are the ones that make bangs so appreciated. 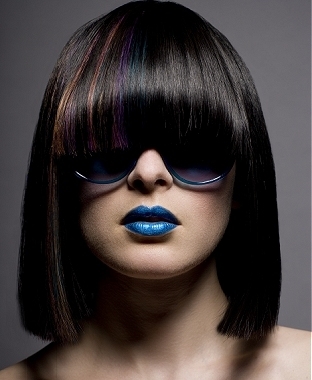 Bangs hairstyles have been popular for many years now and it seems like they will never go out of style. There are two types of bangs, depending on the way they are cut: full frontal bangs and side swept bangs, but there are a variety of styles these bangs can be cut in. Because of the diversity of face shapes and features, people opt for different lengths of bangs in order to enhance or conceal certain features one wishes to emphasize or diminish. Bangs also offer changes in hairstyle for people who do not wish to modify the length of their tresses or the cut of their hair. Because the bangs are cut just from the front of the hair line the rest of the hairstyle doesn't require any adjustments, making bangs perfect for a mild makeover. 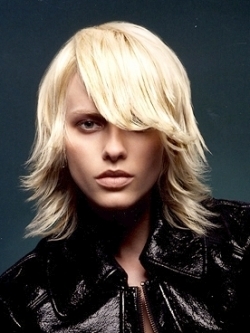 Medium length hairstyles have become very popular because of their relatively low maintenance. Medium hairstyles can offer different styling opportunities, depending on the haircut. There are a variety of hair cutting techniques developed in order to obtain different results and bring out the best out of every hairstyle. Also the bangs' length can be personalized to match every persons facial features and preferences. Inspire your medium length hairstyle with bangs from Hollywood celebrities. The best way to determine what type of bangs are suitable for you is to find a celebrity with similar face shape as yours and copy the celebrity's bang style.